There is a "disgraceful" variation in the number of proportion with dementia being diagnosed across the UK, according to the Alzheimer's Society. 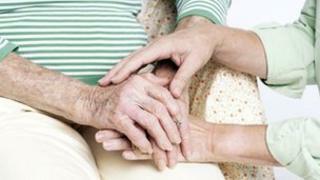 About 800,000 people in the UK have some form of dementia, but most have not been diagnosed. Estimates by the charity suggest 32% were diagnosed in the East Riding of Yorkshire compared with 76% in Belfast. The government said the variation was "unacceptable" and caused "unnecessary suffering". Predicted levels of dementia across the UK were compared with data from GPs on the actual number of patients being diagnosed. The map suggests a north-south divide, with the highest rates of diagnosis in Scotland (average 64%) and Northern Ireland (average 63%). Rates dropped to 50% in the north-east of England, 41% in the south-west of England and 39% in Wales. Dementia is an umbrella term describing a serious deterioration in mental functions, such as memory, language, orientation and judgement. There are many types, but Alzheimer's disease, which accounts for two-thirds of cases, is the most well-known. Across the whole of the UK, the percentage of people with dementia who have been diagnosed has gone from 43% in 2011 to 46% in 2012. Jeremy Hughes, the chief executive of the Alzheimer's Society, said: "It's disgraceful that more than half of all people with dementia are not receiving a diagnosis, and disappointing to see such a disparity in diagnosis rates in different regions of the UK. "This goes against best clinical practice and is preventing people with dementia from accessing the support, benefits and the medical treatments that can help them live well with the condition." The charity said one explanation was variation in "stigma", which resulted in people not visiting their GP. The higher figures in Scotland were put down to a better relationship between social services and the healthcare system. Health Secretary Jeremy Hunt said: "The small improvement in dementia diagnosis is good news, but the extreme variation across the country is unacceptable. "It's time for the worst performing areas to wake up to the dementia time bomb." He said failing to diagnose dementia was delaying treatment and "causing unnecessary suffering".